New Item! Expected to Ship 08-05-2019. This limited-edition, two-company hybrid delivers incredible overdrive tone in a unique bass housing. 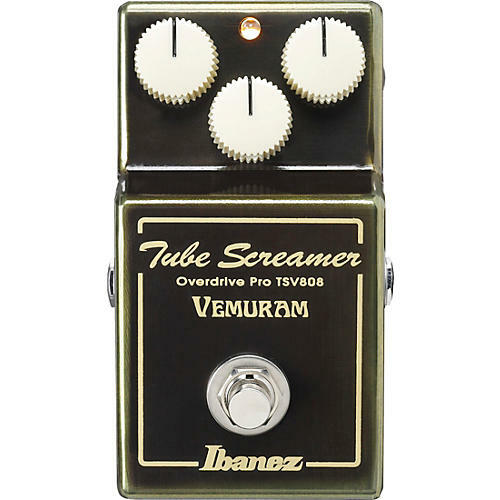 The Ibanez TSV808 was developed in collaboration with Vemuram, a high-end boutique pedal manufacturer from Japan. Vemuram pedals have caught the attention of the market for their unique brass enclosures. However, their reputation is built largely on their tone, proven by their roster of high-profile artists, such as Michael Landau, Mateus Asato and many more. Although the TS808 and Jan Ray were the guiding principles under which this pedal was created, the goal was not simply to line them up in series. This “Next Generation Tube Screamer” has the Tube Screamer’s signature mid-boost, but also the wide dynamic range and frequency response of the Jan Ray, yielding a sound that is entirely new. To achieve this, each component was carefully selected by the engineers from both companies, including the customized parts and a quad-layered PCB used in the Jan Ray. In the end, the TSV808 is composed of some of the highest-quality, first-class components possible. Chief among these high-quality components is the brass enclosure featured on each TSV808. Compared to the chassis made of Zinc die-cast, the brass enclosure work process is 100% handled by expertly skilled Japanese craftsmen. It involves a significant amount of extra work and time to create these unique enclosures. The TS808-style chassis is colored in a blended tone of brass and a dark shade of green. The location of the control knobs is the same as TS808, from left to right, Drive, Tone and Level. The maximum volume is also set 7db higher than the original Tube Screamer. Aesthetically, the design exhibits the signature elements of both Ibanez and Vemuram.